Round-houses, Holes in Roofs, ‘Reconstructionisms’, Stonehenge and Durrington Walls. It is a tricky thing reconstructing stuff. The first reconstruction of something tends to set the trend, and further reconstructions are often really recreations of the first persons interpretation rather than new approaches or even genuinely based on the evidence. As I am an instrument maker, I can give you a good example of this with regards to lyres. When the British Museum asked Arnold Dolmetsch to make a reconstruction of the Sutton Hoo lyre (a fragmentary find originally interpreted as a harp) he didn’t have much to go on. No pegs, and seemingly no tailpiece. He did what anyone would do, and filled in the gaps with what knowledge he had. Since he was a violin maker his reconstruction featured pegs in from the front and a nice tailpiece, clearly modelled on medieval violins. 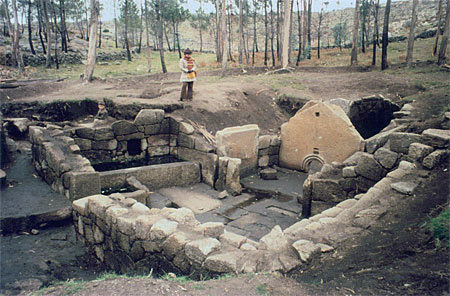 When people made the first reconstructed round-houses they tended to base their designs on extant buildings from Africa. The traditional African level of technology is Iron Age after all so this doesn’t seem like a bad idea. 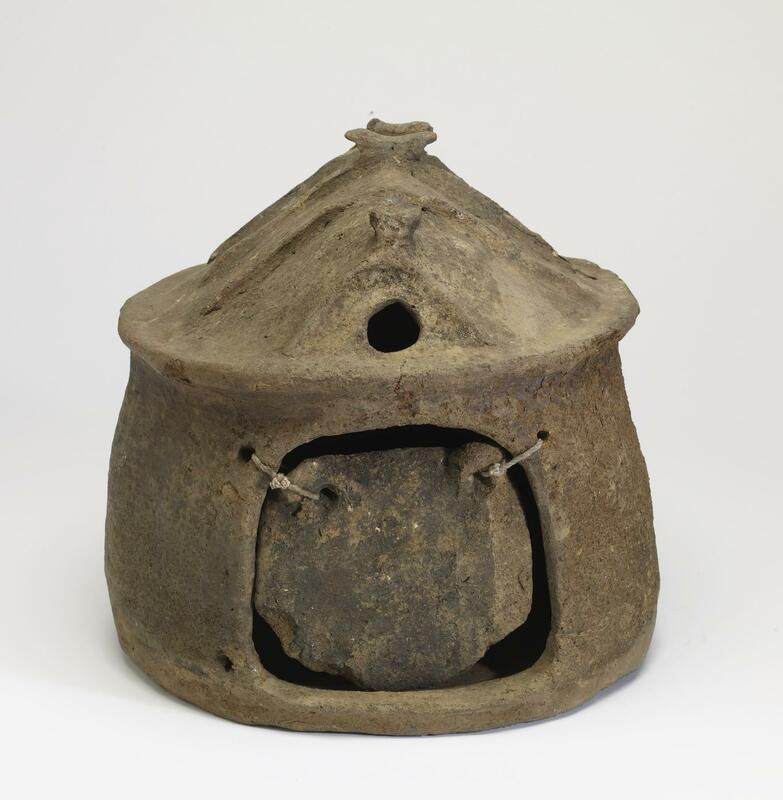 Many African roundhouses are conical and have holes in their roofs, or thin thatch at the centre, and the first reconstruction built by Peter Reynolds at Butser Ancient Farm also had a smoke hole and a conical roof. Sadly for the history of roundhouse reconstructions this first building burnt down. The staff there to this day blame the hole in the roof, for causing the fire to draw too well. The logic trotted out to every visitor of every reconstructed roundhouse everywhere is that a closed roof causes the build up of CO2 in the roof, and this extinguishes sparks. Of course it also causes the build up of CO2 inside the lungs of anyone who is inside the roundhouse as they inhale the smoke. This is worsened by the usual burning of entirely the wrong types of wood. For goodness sake, people, burn small hazel and pine sticks not smouldering chunks of lumpwood! Native Americans talk about the ‘Grandmother Fire’ which you have in the Tipi. This term doesn’t mean a fire to keep Granny warm, but rather a fire made of sticks of a size that your Grandmother could break. Anything thicker shouldn’t be burnt in a Lodge, or a roundhouse for that matter! So now we all build African Roundhouses with Peter Reynold’s adaptation, ie no hole in the roof and then light fires with massive chunks of lumpwood and marvel at the ability of our ancestors to endure such awful smoky conditions…. The Celtic Roundhouse has become a Reconstructionism. 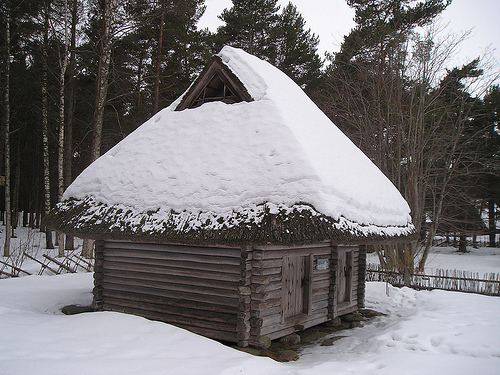 I would like to suggest two sources of alternate ideas for roundhouse roofs. 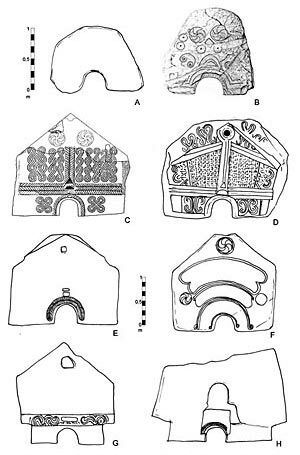 Firstly archaeological finds of model huts from the early Iron Age Villanoven culture of Northern Italy would seem an obvious source! Unlike African buildings these have to weather a European climate, and they are from the right period, so they would seem much more obvious candidates as the basis of reconstructions here, in my opinion. Some of these hut urns are very detailed, and they show two features at variance with the Peter Reynolds school of construction. So as you see they have holes in their roofs, but not in the centre but at each gable end. The second thing is that they have gable ends, ie the roof isn’t a simple cone but rather a hybrid of cone and apex. There are also some branches fulfilling some role in holding the thatch down, some seem to show shuttered window openings, and the bronze one above has rings hung around the edge of the roof which could represent weights to help keep the thatch down, as used in Ireland until quite recently. When I was working for the people who built the reconstructed Neolithic houses at Stonehenge, I was able to persuade the designer to adopt this roof shape, and they look very fine. Sadly for reasons I do not understand he did not include the smoke holes, perhaps to amuse South African visitors who upon entering the reconstructed buildings always remark “we have buildings like this at home in Africa, except that ours have smoke holes. Why don’t these have smoke holes?”. Perhaps buildings with smoke holes in the centre let the smoke out a little quickly, and as Peter Reynolds discovered, burn down? Perhaps they don’t, perhaps buildings with the seed heads left on the thatch (ancient varieties would have shed theirs naturally) are prone to burning down. Perhaps you should just have a smaller less hot fire? Its tempting to really stoke those lumpwood fires up to try to burn off the smoke. Anyway there is obviously no problem in having holes in the eaves, as the numerous Hut Urns testify. Maybe there are some extant buildings with a long history that might answer these questions? It turns out there are. 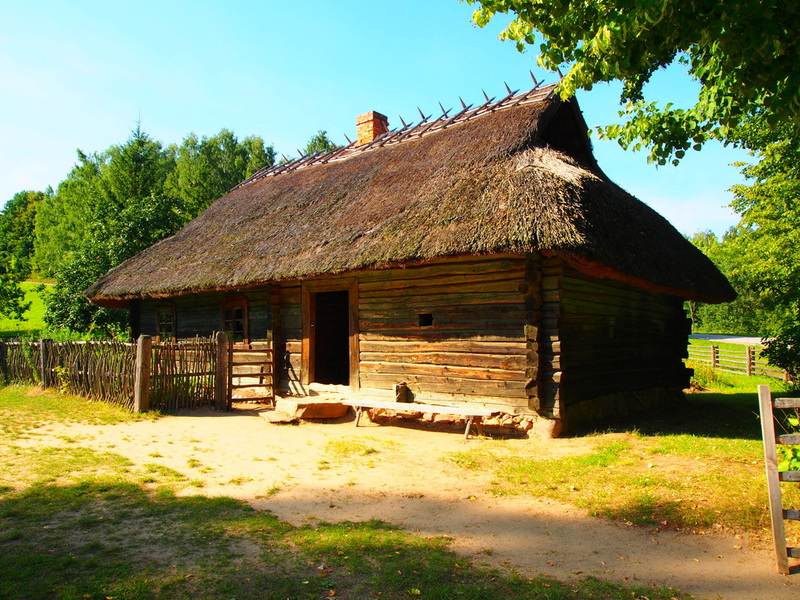 The Baltic, an area that is extremely conservative culturally (Lithuanian for example is considered the closest living language to Proto-Indo-European) happens to have a vernacular architecture that uses exactly this style of roof. Its not too far off a Viking Longhouse/Medieval Long Hall roof actually, with their holes in the gables (that eventually evolve into chimneys in the long hall). 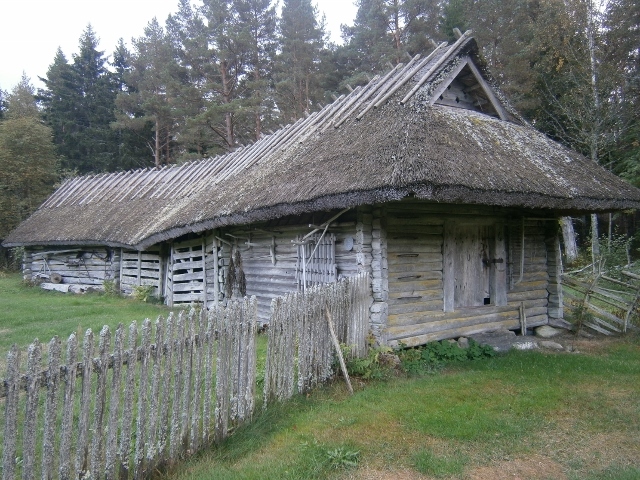 Viking Long Halls even featured a small raised apex roof in the centre of their rooflines to let out smoke, according to most scholars. 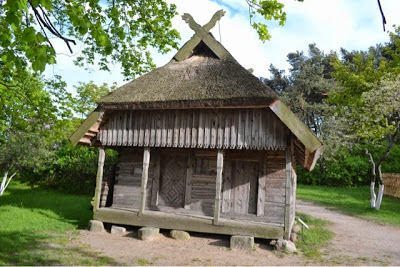 I consider these buildings, and the hut urns, far better models for the roofs of British roundhouses than the conical African hut we’ve all been copying from one another, and they even fit into an evolving architecture as the prototype of longhalls. When Kate found that last image, the one with two buildings one of which features a large roof overhang held up by some poles, it got us thinking what these buildings would look like in the ground if you dug them up. What would they look like if they had a hazel fence around them to ensure privacy, and/or some poles to help hold up the roof? It would look exactly like the Durrington Walls buildings do. 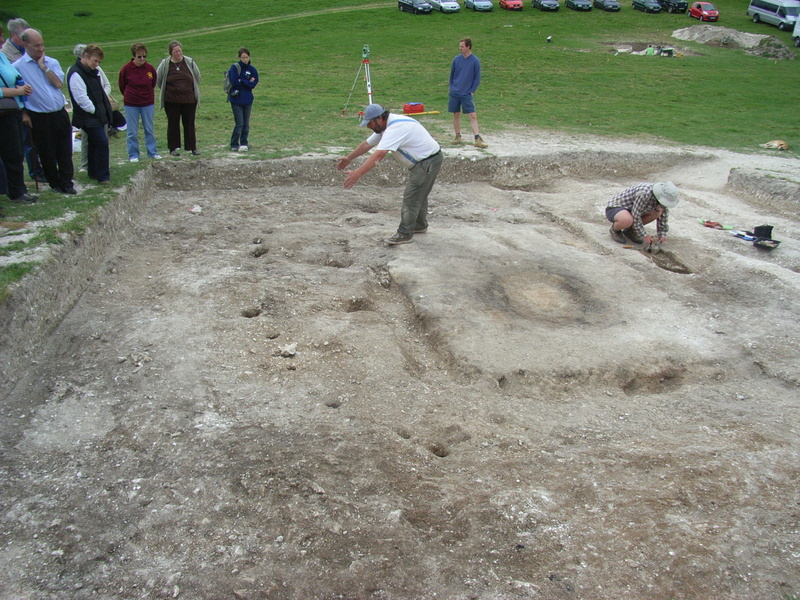 These remains have been interpreted as fairly large squarish roundhouses with hazel wattle walls. Inside each house is a rectangular area of carefully finished chalk floor, with long sockets around it. 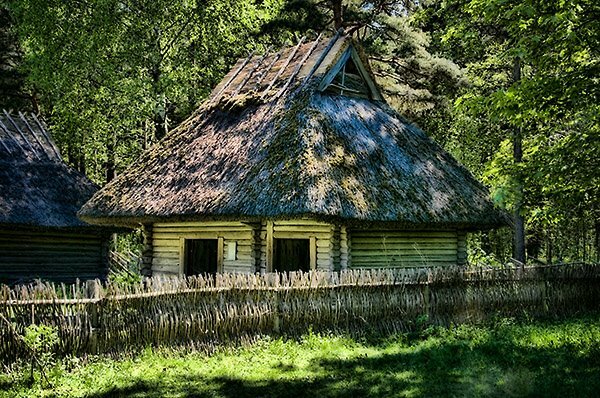 For some reason our ancestors didn’t finish their floor up to the wall, and had large pieces of built in furniture made of logs set into the ground. I suggest that this interpretation is entirely wrong, and what we are looking at is a smaller rectangular building with a fence around it. The building is either constructed from logs, or has footings to the walls made of logs set into the ground, and the entire internal floor area is finished, as is the case all over the world. For anyone who thinks these buildings would have been too small if they only occupied the area of the finished floor, I should remind them that they are interpreted as temporary accommodation for visitors to Stonehenge. Also I should say that having lived for many happy years in a 14′ caravan, the size of these buildings would be luxury in comparison! 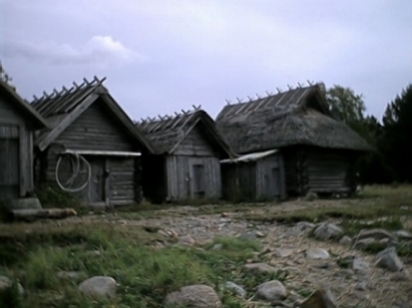 They are also roughly the same size as many old wooden houses we saw in Scandinavia. 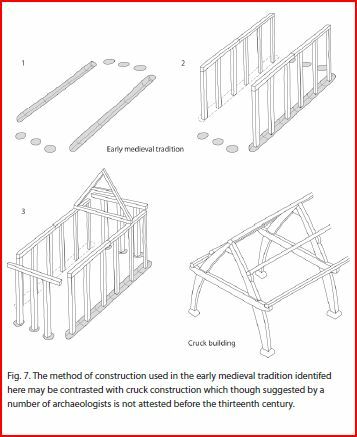 As one last point, I am going to add a picture of the latest thoughts about Anglo Saxon ‘Sunken Feature Buildings’ taken from Mark Gardiner’s work “An Early Medieval Tradition of Building in Britain”. As you see it features a log floor plate, just like my interpretation of the Durrington Walls buildings. So were the Durrington Wall’s buildings on a log footing, with a fence around them? Have we become so hypnotised by the Reconstructionism of the typical roundhouse that we see them everywhere and can’t see the alternative? It does answer the question of why the floor ends so abruptly short of the walls. 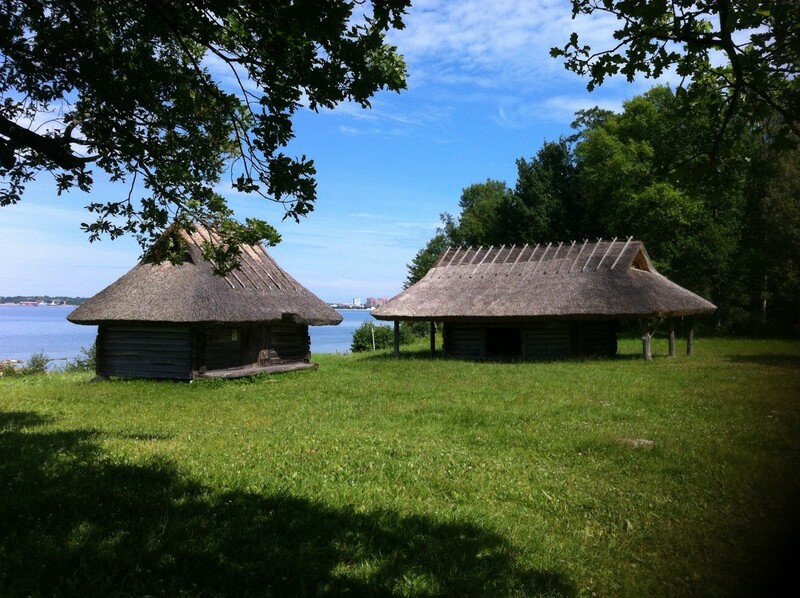 Perhaps they were roofed like our hut urns or Estonian Fishing Huts? I personally am certain of one thing though, they had holes in their roofs. Kate and I went on holiday to the Dordogne last week and looked at a lot of Paleolithic art in the caves there. 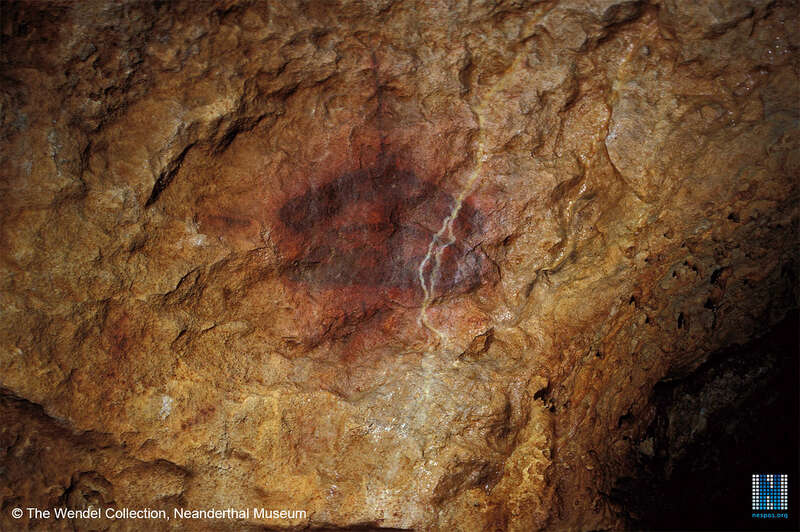 One of the many mysteries to do with this art are the so called tectiform images. Tectiform means ‘roof shaped’. 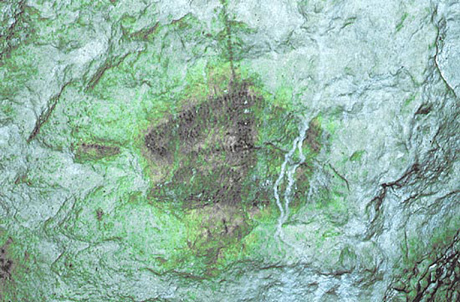 These odd images appear in 9 caves in the region and, as far as scholarship is concerned, nowhere else, though there are similar images in Cantabrian rock art. No-one knows what these symbols mean. 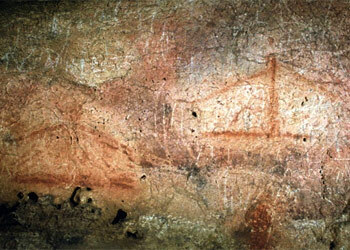 They are said to have been painted between 17000 and 13000 years ago, and then they disappear. and here is an infrared picture of the same image which allows us to see it has many details. It is in fact made up of around 500 tiny dots. We spent some time thinking about these. My initial intuitive impression upon seeing the Bernifal one in the flesh was that it was a bird rising above a Sweat Lodge, an image I knew from Native American culture where this being is known as the Thunderbird. I have experienced this myself once when doing a Sweat Lodge ceremony in Dorset. 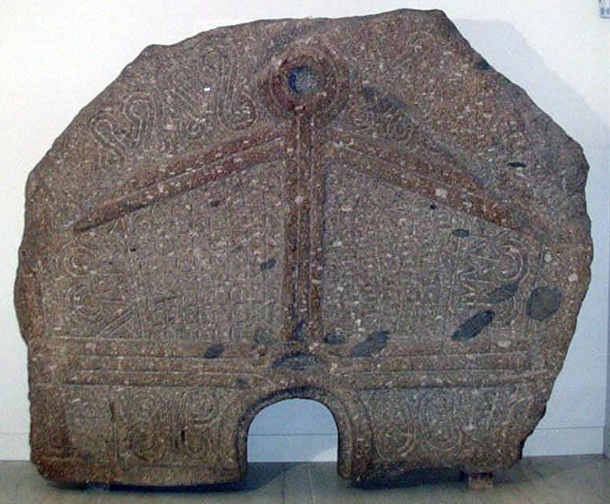 I had the sense that the circles inside the lower shape represented people, stones, or possibly ‘endurances’, ie rounds of sweating, and the shape above was the Thunderbird, or something similar. Just a hunch. 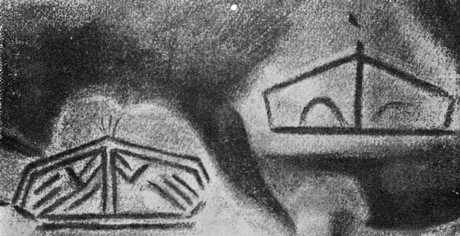 Could it be that 13000 years on the descendants of the artists from Bernifal and Font de Gaume were using the same symbol to mark the entrance to their underground sacred spaces, their own sweat lodges/saunas? As far as we can tell no other people have ever made this connection. 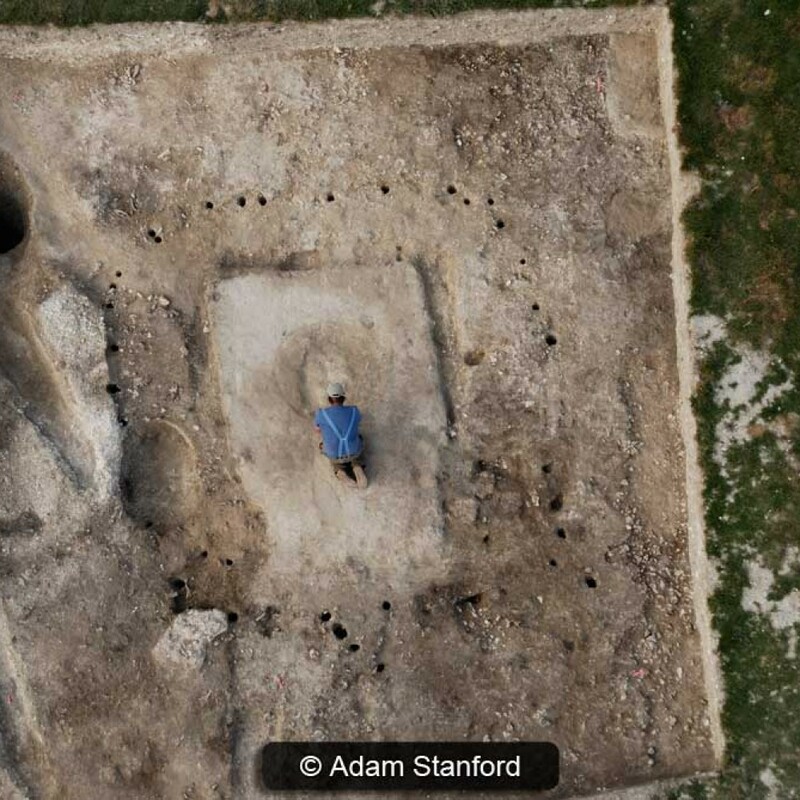 If we are the first, I hope someone with some archaeological knowledge finds this and runs with it, as it is obviously a possible connection that needs to be explored, and we don’t have time, money or academic access! I hope they give us some credit! In the meantime, Paleolithic Sweat Lodges/Sacred Sauna seems like a fun thing to try in the name of experimental archaeology. The following article was originally published in a much shortened form in Pagan Dawn magazine, Samhain 2013. I thought I’d put the full version here for anyone interested. It also includes a good description of some of the design philosophy behind The Bear Feast, our Midwinter event. Paganism is a hard thing to define. Personally I know what I consider to be its core, but opinions vary. For this reason its often easier to delineate Pagans by what they do, rather than what they believe, Orthopraxy rather than Orthodoxy to use the technical words. One of the more important things that most Pagans do is ritual (I’m not talking about everyday ritual acts like cleaning teeth here, I’m talking about those special ritual actions we do as part of our ‘practice’). We do ritual a lot, rain or shine, on our own, with covens, groves, at camps, at open meetings, from memory or from slowly disintegrating damp bits of paper. Why? Maybe if we think a little about why we are doing it we can consider whether we are getting the most out of it? For many of you none of this will be new, but it is sometimes a good exercise to strip things back to first principles so I hope you won’t feel patronised. Getting in touch with something or contacting the transpersonal. Whether you define the transpersonal as Deity or as your unconscious mind, ritual can help us reach out to the ‘other’, within or without. This reaching out can achieve anything from communication to actually embodying some other transpersonal force. Examples: Drawing down the Moon, the Wiccan rite whereby the Priestess embodies the Godddess and speaks as her. Vision Quest, where the aspirant hopes to catch a glimpse of the forces that underlie reality and gain power or knowledge from this vision. The social aspect, bonding groups and establishing boundaries. Ritual can be a solo activity but is more often done in a group. The simple act of being together in the heightened state of ritual time can strengthen groups, but ritual is also used, through the concept of Initiation, to mark the entrance of people into a group. Examples: Druid Initiation, at my initiation I became a full member of my Druid Order. Even though I had paid the money and done the course a physical initiation ceremony was a powerful marker which changed how I felt about myself and the group. Achieving change, magick and psychology. Perhaps we want to change how we feel or think. Perhaps we want to change something in the world through non physical means (if one believes this is possible). Ritual is certainly a powerful way to change how we feel about something, or to change our view of ourselves. Example: Coming of Age ceremonies exist in many cultures to mark and smooth the change from child to adult. Many Pagans are seeking to facilitate their own children’s growth in this way. Comfort. Lets not underestimate the simple fact that ritualistic behaviour and the sense of altered perspective it brings can be comforting and offer solace, often through contact with something beyond the self, or through simple familiarity. I think there is a degree of comfort implicit in the social bonding achieved by successful rituals too. Delineation of time and space. Ritual may be used to mark out a time or a place as somehow special, dedicated to a certain purpose or worthy of increased respect or different behavioural norms. Example: The Consecration of an Altar in a room may add a sense of peace and sacrality to the space and enable further work such as meditation to take place there. Art. Ritual can be a form of artistic expression in its own right. It seems that the overly theatrical rituals typical of Victorian occult groups like the Golden Dawn are close to theatre and are as much artistic experiences as magical ones. I’m sure there are many other reasons too, and any ritual may include several of the above elements. In order to achieve the above end results we can use many different techniques or tools. Of course most rituals probably include many of these and perhaps more that we haven’t thought of. Here are a few ideas though. Obviously there is a great deal of overlap through between these two broad categories, as they both ultimately work on the minds of the participants. Physiological Tools. These work on the mind primarily through the body. They exploit our own body’s responses to fear, discomfort, sensual stimulae, sexual arousal or adrenaline and thus heighten our sense of being in that moment. By giving us a heightened experience we may be able to enter intense emotional states more easily, we will also be more likely to form lasting memories of the ritual, which is important if the goal is to achieve some long lasting psychological shift. Examples: darkness, firelight and flickering light, disorientation, unusual sounds, smells, sights, locations, posture. These may be combined; in my initiation into the Bardic Grove for instance I was blindfolded (in darkness, disoriented and somewhat anxious), robed, led by the hand (sensual stimulae), asked to curl up like a seed (posture) and exposed to incense, chanting and music (sounds, smells etc). As part of the ritual I stood up and was unblindfolded (posture again and light etc), and found myself in a wood (unusual environment), all of which served to put me in an extremely heightened sense of awareness which made the words spoken to me, and which I spoke, more powerful. Psychological Tools Many of them rely on changing the environment we find ourselves in to one that is significantly different from our everyday experience, one that may have symbolic or meaningful content. These include special words or music, symbolic costumes or objects, drama or narrative. These things are chosen to be beautiful or elicit some other emotional or rational response. Drama and narrative and symbolism are especially important as they allow us to bring deep content into our ritual without having to explain what everything means explicitly. We all know what a person wearing black with a skull mask and carrying a scythe represents, there is no need to talk about what death means or describe it in words. In this way symbolic items or characters can stand in for large and complex concepts, and are well understood as such by both conscious and unconscious minds. The deep meaning of actions carried out by or with these symbolic objects or characters are understood very well by the unconscious mind. Social relationships and status may also play a part, initiations are often carried out by the most ‘important’ people in the group and their status adds to the effect of the actions. Altered States. All of these factors may contribute to us entering an altered state of consciousness. I don’t want to go into this area in great depth as it could be the subject of a whole series of articles, but basically any state other than our normal waking consciousness could be considered an altered state. In some altered states, such as light trance, we are open to suggestion or more likely to experience glimpses of the transpersonal. Even the state of heightened arousal we mentioned above is an altered state of consciousness, though one that we may not notice in the moment. Repetition. Repetition deserves a paragraph all of its own. Repetition within ritual, repeating the sacred words for example, or repeating narrative elements in the manner of a children’s story, is important because it can put us in an altered state of consciousness, or more prosaically simply drum words or images into our minds. A standard familiar opening or closing, if not too long or uninteresting, may be helpful in establishing mood. Repetition of entire rituals themselves is also extremely powerful. A major shortcoming (in my opinion) of many Pagan rituals is the feeling that we should re-invent the wheel and write a new ritual each time. This is unnecessary and may actually be seriously counterproductive. A well designed and enacted ritual gains tremendous power through expectation and repetition, we don’t need to worry about boring our participants if there are enough dramatic, sensual, psychological and physiological elements for them to experience! If you feel you have hit upon a successful form, why change it? Why not let it run and refine it instead? So we want to do a ritual. Firstly think about what we are trying to achieve. Without a clear purpose we will achieve little. I’ve been to too many seasonal rituals that are carried out just because it’s that time of year. They lack focus and are generally unsatisfying experiences. It is of course perfectly acceptable to have a ritual as pure theatre or as a get together, but if you do why not use your skills to make it artistically or socially fulfilling for all concerned? Having delineated our purpose or purposes then it is time to think what elements from the toolbox of ritual would be appropriate. Finding a central image may be useful, or a central process. A symbolic action might be enacted, like the famous reaping of an ear of wheat in silence, or the baptismal immersion in water, and this central action can be surrounded by other elements which reinforce its symbolic meaning or psychological or physiological impact. Simplicity is often more powerful than complexity, there is only so much that the mind can grasp without becoming overloaded. It is especially important not to overload the mind with too many words! Images and actions are far more powerful, words are no substitute for them. Too many words may lead the participants to lose interest and switch off, there is no rule about how long a ritual has to be, make it short and punchy rather than long and dull! Here are a couple of case studies which hopefully illustrate these elements of ritual design. The Mercian Gathering is the single biggest outdoor Pagan gathering in the UK. Designing a meaningful ritual for a group of almost 1000, some of whom may know little about Paganism and the others will be from many different traditions must be a challenge to say the least, but I feel that the Mercian Gathering achieve their goals well. The ritual begins with symbolic cleansing by passing through a fire labyrinth to the sound of pipes and drums. This uses many of our physiological tools above, fire, darkness, sound etc. It marks the entrance into a liminal time, once we have passed through the labyrinth we are in a different (head)space. Everyone then processes to the Wicker Man where some have hung offerings and prayers in the hours preceeding . The procession, with its sights and sounds serves to add a sense of expectation. Everyone circles the Wicker Man and the fire is lit with flaming arrows- a far more marvellous spectacle than lighting it with a match would be! There is dancing and music and cheers as the Giant falls- the sacrifice is complete. Later bread will be cooked in the embers, in the morning the bread will be drawn forth, a suitable resurrection with rich symbolic meaning. There is another procession, bearing solar imagery, to the main circle where the bread is shared. This ritual has many powerful visual images and coupled with the symbolic sacrifice and rebirth is satisfying emotionally and rationally. It could inspire a ritual on a small scale too, following a trail of lanterns through a wood to a place where among chanting celebrants a corn dolly is sacrificed, burnt, and a loaf pulled from its ashes would be equally powerful if somewhat less spectacular! The Bear Feast takes place at Midwinter. We were inspired by two things to create this ritual. Firstly ancient bear ceremonies that were carried out all around the sub-arctic regions, and secondly by Graham Harvey’s writings on Animism, and more specifically a talk he gave at an OBOD camp many years ago about one of the origins of religion being our need to apologise to our food. The emotional or spiritual purpose of the Bear Feast is to forge a compassionate connection to the food we eat and the lives that are inevitably taken in its production, directly or indirectly. If we are respectful to those other-than-human-persons who literally died that we might live, then we should try to live our lives to the full. Bear Feast is a weekend event and thus is in effect made up of several connected mini rituals, though the whole thing hopefully functions as a kind of unity. Firstly on the Friday evening people gather in the recreated Viking Longhouse, we hold hands and all introduce ourselves and share food, then we all learn and practice the songs we’ll use the next day. There is obviously a practical aim to this (eating and learning the songs) but more importantly this time serves to bond the group together, so people can relax and feel safe and thus more able to appreciate the other parts of the weekend. The setting, firelight etc also help to add a special mood, though we are not really deeply in ‘ritual time’ yet. We do start to observe the taboo against speaking the word ‘bear’ however, which is extremely difficult at an event called the Bear Feast! All sorts of amusing euphemisms must be concocted and forgetting the taboo will be met with mockery! Use of different language in this way also reinforces the specialness of the events taking place. Early on Saturday morning, while it is still dark, we wake everyone who has been sleeping in the Longhouse with drumming, tea is made and folk get dressed and perform their ablutions but everyone is encouraged to speak in hushed voices to maintain if possible the liminal state between waking and sleeping. Eventually drumming becomes chanting and the (previously selected) hunters assemble by the doors with their spears. They are smudged and blessed with an ancient poetic hunter’s blessing translated from a Finno-Ugric poem and while this whole process is going on we all sing some of the songs we’ve learnt. The atmosphere really builds (as you might expect in a Viking Longhouse at dawn full of incense, firelight, chanting, drumming and beautiful poetry) and there is a great sense of expectation. Everyone leaves and we process around the site until we come to where the (person impersonating the) bear is hiding. The bear is woken from its hibernatory sleep according to an ancient formula and is then ‘killed’ by the hunters, again in the way expected by tradition. In the dim dawn light the hunt looks quite convincing and even though everyone knows this is ‘pretend’ the build up and the imagery is so powerful that you are moved in spite of yourself. The men and women (or as we like to say ‘those who identify with stereotypical male and female roles…) separate and the men remain with the bear to remove his skin (an antique real bear skin) and then hold a symbel where we make boasts and promises. 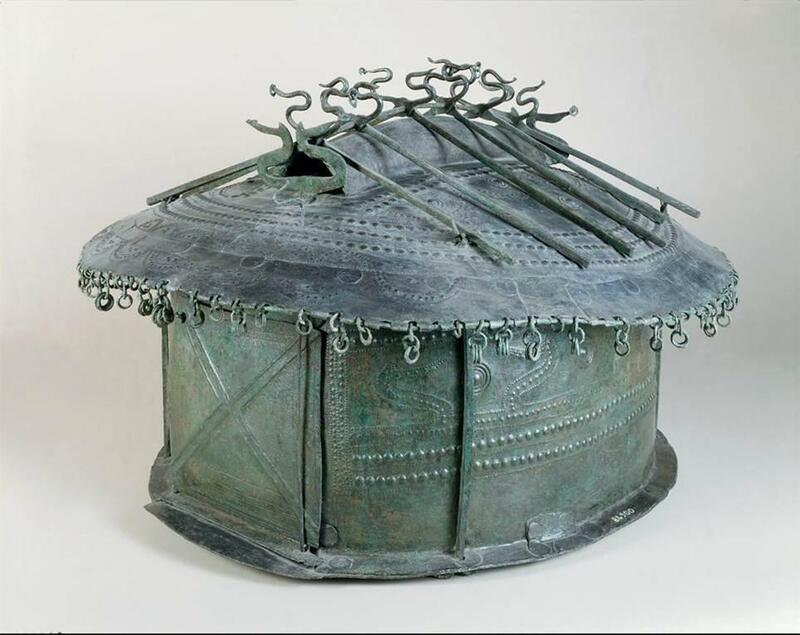 This is bonding for the men but also gives the women time to prepare the Earthouse, the large roundhouse where the later parts of the ritual will take place. The women symbolically clean the space, smudge it and sing a special song. They light the fire, all these actions are explicitly carried out to honour our ‘guest’, the bear. The men process to the door singing, and there is a ritual exchange of words through the closed door. Eventually the door is open and the men carrying the bear enter, they are sprinkled with water and welcomed with song, the bear is taken to his place of honour where his throne and its surroundings are decorated with offerings representing the food we have eaten that year. In this part of the ritual we see the central image or narrative starting to emerge. The Bear represents our food, by killing him we acknowledge the role of death in bringing us food and by honouring him we honour the things which we have eaten. Later in the day we have a talk and then silly games, ostensibly to choose next years hunters but also to honour our furry guest. We have a meditation which brings the last year of our lives and the coming year into focus and attempts to call up a sense of all those persons we have eaten, with the intent of honouring them. This is the most transparent part of the ritual with regards to its meaning as it is explicitly stated, but it is woven into the ritual as a whole and serves as part of the preparations for our sacred meal. This meal represents the bear’s meat but is usually of local venison (with a vegan option!). There is music and song followed by the last part of the ritual, where the bear skin is levitated with the power of our song up (at least that’s how we describe it) out of the Earthouse roof, while objects representing the prayers we send with him burn on the fire. Sometimes we have let off a firework as a sign of his ascendance. There is a strong element of play acting and some humour in all this but it in no way diminishes the seriousness or the magical or spiritual power of the experience. Mirth and reverence can happily co-exist. The bear will of course return from the Sky Father next year, as all the matter in the world moves through cycles of animate and inanimate existence, those atoms which make up our bodies being no exception. The Sunday morning ends with an exchange of gifts and the extinguishing of the fire, each participant pours a cup of water onto the fire resulting in a great cloud of steam and smoke, a good action to mark the ending of that years Bear Feast. This ritual then combines the strong central image of the death, consumption, ascension and assumed return of the Bear with many of the tools of ritual we spoke about earlier. Location is important but the timing of the more symbolic parts of the ritual to take place at night or early in the morning, by firelight, to the accompaniment of ‘bells and smells’, chanting and drumming, is deliberate. There are many small touches to involve each person present, from exchanging gifts to dressing the altar and playing communal games. Perhaps most crucial is the fact that we have as much as possible tried to keep the event as similar year on year as possible. We have obviously refined it, and in fact a few years ago changed the order of its parts quite radically, but now it seems optimal we will keep the words, songs etc the same. We can draw on the power of repetition which both deepens everyone’s experience and also makes things run more smoothly, eventually Bear Feast should run itself, people will know their parts and the songs and what happens next. There are already signs of this happening. So to summarise when planning ritual boil down your purpose into a few images or actions, and then find some way to make them have visual or psychological impact. Surround them with elements calculated to add intensity to the experience. Carry it out with pace and feeling. Job done! What do you want to be different after the ritual? I’ve just returned from a wonderful Winter Solstice weekend; the annual gathering of the Bear Tribe at the Ancient Technology Centre. The aim of the event is to celebrate and honour all the plants and animals – fellow inhabitants of this planet – that we have eaten this year. All life depends on the deaths of others, but that is no reason to be thoughtless or careless about that sacrifice. If you are interested, you can read more about the principles of Animism on the Bear Tribe’s website – and also perhaps decode the meaning of this post’s title. Apologies for the lack of pictures. I thought it was important to get this up quickly, and I need to replace a broken cable to get the pictures off my phone. Hopefully I can add the photos I took today in a day or two so check back soon. Today I was lucky enough to visit the new Stonehenge visitor centre. Before I say anything else I should declare my interests- firstly I work part time for the Ancient Technology Centre, Cranborne, who are building the Neolithic buildings which, when finished, will form part of the new visitor centre. Secondly I am a Druid. There has been a great deal of debate (not always good natured ) among Druids about the new visitor centre, firstly about its design and planning, but more recently about the display of human remains. I’ll give my two-penneth about this issue a little later in this post. Firstly some thoughts about the location and the building. The new visitor centre is a considerable distance from the stones. The stones can’t be seen from it, although it has some good views of the surrounding countryside. The building is interesting, a single roof covers two distinct ‘pods’, one of which, clad with timber, holds the ‘gallery’ (museum) and the other made of glass holds the cafe and shop. The space between the two makes a fairly wide atrium which holds the ticket booth, and to be honest is a bit of a wind tunnel in the winter, though it will be wonderful in the summer when the majority of visits are made. The tickets now cost around £15 for adults, almost twice what it cost before. I think this reflects the improved facilities, but is a little overpriced. I’d have been happy to pay £10 to £12. Once the Neolithic buildings are finished it will feel better value perhaps as there will be more to see. The roof is held up by many thin posts and the edge of the roof has small random holes in it, which combined give some sense of the dappled light of a woodland edge. The toilets are accessible from the outside of the building here. The cafe is a reboot of the old hole in the wall and offers tea and pasties. I was pleasantly surprised by the reasonable price of the tea, which comes in a big cup and is good quality. I was also happy to hear that the cup and its plastic lid will be recycled. Pastie prices were what you’d expect, but you can eat and drink for a little over a fiver. No option for a proper meal, but I think the cafe ‘offer’ is designed to get people through as fast as possible. The shop is large and has a very good selection of books, including some of the more thoughtful Pagan and Druid books and a lot of history and archaeology books. I know I’ll be going back for these. The new guidebook by Julian Richards is £4.99 and very good value, well written, informative and brilliantly illustrated. I wasn’t able to buy a copy of the exhibition guide as they were out of stock. On the other side of the atrium is the museum entrance. They checked our tickets here so I imagine it is possible to go to the shop and cafe without paying the entrance fee. Walking into the entrance you come to a circular room whose walls are a continuous screen. A film is projected onto the walls which cycles through the phases of Stonehenge’s building, and then fast forwards to the present, all seen from the viewpoint of the centre of the stone circle. It isn’t a substitute for being in the stone circle itself, but it is atmospheric and interesting and gives a sense of the passing of the millenia. Step out of the circular cinema and ahead is a group of interpretation boards with the grand name of The Meaning Totems. These have some quotes on them, and there are more diverse literary quotes on the wall too. There is also a film playing in this area on four screens, which has a potted history of the various interpretations antiquarians and archaeologists have made of Stonehenge over the last few centuries. The film includes a disappointingly brief reference to how some modern people think the site is important, annoyingly misusing the word ‘spiritualism’. This absence of the contemporary is a big gap in the permanent exhibition. Other multi-media present include an extremely large video screen which shows a fairly long and detailed animation showing Stonehenge in its landscape context, a detailed timeline affixed to one of the walls, and screens built into the display cases showing the making of many of the replica objects as well as animations outlining the techniques archaeologists believe were used to move the stones. All this multimedia is extremely well done and very informative, and I’m sure will add a lot to visitor’s appreciation of the site. A second room holds the temporary exhibition space. Each summer this will hold Julian Richard’s collection of Stonehenge ephemera, so at least for three months of the year there will be some reference to the Henge’s recent and often turbulent and contentious history (in my opinion this collection should be on permanent display here, possibly on the as yet empty rear wall). The other nine months of the year will see a rolling programme of different exhibitions related to the Stones, starting with an exhibition of historical books. Next year I’m told will be an exhibition relating to the wartime history of Salisbury plain. Lastly we come to the contentious part of the museum, the display cases. These are each designed to answer a commonly asked question about Stonehenge- such as How was it built?, What was it for? What were the people of Stonehenge like? etc. There are many interesting artefacts here on loan from Devises and Salisbury museum, though if you like looking at old stuff I’d still recommend a visit to Devizes Museum over the Stonehenge Visitor Centre as Devizes has a fantastic collection, now displayed in recently refurbished exhibition space. These cabinets however are also the current home to three sets of human remains. Now some background to the debate; for several years a Pagan pressure group called Honouring the Ancient Dead (HAD) have been campaigning to encourage reburial or failing that the sensitive display of human remains. HAD have consulted with both Pagans and museum professionals and drawn up a code of best practice for the display of human remains, which you can read here. Also more recently Mr Arthur Pendragon and his allies have been campaigning vigorously to have the cremated human remains found in one of Stonehenge’s Aubrey Holes reburied rather than displayed in the visitor centre, and indeed they were protesting outside the visitor centre today. I personally am not opposed to the display and retention of human remains providing they are displayed sensitively. In fact I’d go so far as to say I am in favour of the display of human remains as I feel they can be a tangible link to the lives of our ancestors in a way nothing else can. All that said however the remains at Stonehenge are not displayed sensitively. They are in the same cases as antler picks and reconstructed arrows which seems to symbolically reduce them to the status of inanimate objects rather than what was once the remains of a thinking feeling human being. One person’s bones in particular are wired together and displayed upright fixed to a board in a way that made me viscerally uncomfortable. It is extremely saddening to me that English Heritage did not take a middle way with these remains and at least abide by HAD’s best practice guidelines. The current lack of sensitivity seems almost calculated to prolong the controversy and the protestations and plays into the hands of those most opposed to the display of human remains whilst making it difficult for those of us in favour of display to defend English Heritage. Moving through the museum and out the door to the reverse of the building is the site where the 5 Neolithic buildings based on archaeology from Durrington Walls will be once they are finished in April. Also outside the rear of the building is the pick up point for the land train that takes visitors to see the Stones. On the day I visited the land train (pulled by a land rover) was running at roughly 15 minute intervals. The carriage windows were sadly very fogged up so little could be seen of the landscape despite the sound of what I presume was a dehumidifier running. After a few minutes one arrives at the stones which I have to say are now in a greatly improved setting. It is still obviously a work in progress, as the old visitor centre and carpark is yet to be removed and the old road is in the process of being grassed over, yet two things made an enormous and profound difference. Firstly and obviously the road, and accompanying fence, that thundered past the Hele Stone is gone. The sound of traffic is still present from the A303 a few hundred metres away, but even so the absence of traffic so close is wonderful. Secondly because of the removal of the road it is possible now to walk all the way around the circle. You even have a choice of clockwise or anticlockwise direction (I recommend clockwise…). You really can see the Henge in a way that has not been possible in perhaps 30 years, since my childhood, when the A344 was still a fairly quiet road. You can also approach reasonably close though of course it isn’t possible to go inside the circle. If you want to do this, it is possible to book special access in advance. So to conclude the visitor centre is vastly improved. The exhibition succeeds in its aim of setting Stonehenge in its context and answering the most commonly raised questions whilst providing a more in depth experience for those who seek it. The shop is good and the cafe although basic is serviceable and not overpriced. The Neolithic buildings when finished will be very interesting and really enhance the visitor’s experience. The setting of the Stones themselves is enormously improved. If the human remains were displayed more sensitively I would be completely happy. About 7 or 8 years ago, as Corwen and I were preparing to leave on our long walk to Spain, I was visiting the Abbey Community in Sutton Courtenay. Before I headed out to the shed, to carry on with my handcart construction project, someone told me not to worry about two strange Americans wearing funny costumes in the garden. They’re harmless and really lovely. And that was how I met Ethan Hughes and his (now) wife Sarah. They were travelling Europe visiting off-grid communities, with a view to setting up something similar back in the US. You might be forgiven for thinking this is nothing spectacular, but the thing is, they were possibly the two most amazing people I have ever had the pleasure to meet. At the time, Ethan hadn’t got into a car for over five years, or used a computer, or a mobile phone…All their travel was conducted on foot, bicycle or for long journeys, train. They didn’t fly from the States, they used yachting agencies to find wind powered passage, or took places in cargo ships, where their proportional use of fossil fuels would be absolutely minimal. They always sought out home grown food over bought, and local food over imported food, they didn’t listen to or own any recorded music, and they dressed in superhero capes sometimes, “just because”, they told me…During their stay, I remember Ethan doing a 3 day long meditation and fast in the dovecot. He said he did it every year, when spring was starting, and we talked about ethics (Ghandi had most of it nailed, he said), ecology and environmentalism (keep it simple, he said) and creativity (tell stories, sing songs, make music and be alive, he said), and to be honest, I have to agree! I went over to the Abbey several times while they were staying, and one night we threw a party by candlelight with 6 people, a feast from the garden and a live entertainment line up second to none. Ethan told a bonkers creation story, leaping from chair to chair, being a whale or something, Sarah (a trained opera singer) blew us away with her singing, and I sang and played too. It was magical. When they moved on to the next community they were visiting, I met up with them again, and we spent a day learning how to gut fish and hearing how to make a bow from scratch (first, find your dead deer and a yew tree…). And then we went our separate ways – Sarah, back to the States on a ship carrying organic lentils (you couldn’t make it up and one day I hope I will visit them by similar methods), Ethan, to one last community in Scotland, and me? Well, me and Corwen set off on our life-changing pilgrimage on foot to the end of the world. On the brink of such an amazing journey of my own, to meet them at such a pivotal time in my life did two things: It made me feel braver, and it gave me a life-long reminder that there is more, always more you can do to minimise your impact without minimising your life experience or accomplishment. I have never forgotten that encounter. In fact, I looked up more about them a while ago, keen to find an address if I could, because I lost the red scrap of paper it was scribbled on hastily when we parted. I managed to find out that they did indeed get married, set up a community and are still off-grid, off-line, and in the world like no-one else I know. And then I began to see just how amazing they are. Ethan started the Superhero Bike Ride when he discovered that no-one would help him clean up the beach until he dressed in a superhero cape. It mobilises people to dress as Superheroes and go out on bicycles and do ‘service’ (ie help people in any way necessary) in the community. For the sake of it. And the Possibility Alliance, the community they have built, is thriving, and welcoming people who want to know how to be that alive. They call it ‘Radical Simplicity’ and if you look them up you will find blogs (including mine, now), articles and videos about them by others whose lives have been touched. None of these are by Ethan and Sarah, they don’t even have a computer. But despite not flying, driving, emailing, blogging or even texting, they are sending ripples around the world. And one of them rocked me. And this week I hope I passed that ripple on. We’ve been thinking a lot lately about our environmental impact. Although we live pretty low down on the food chain and have few appliances, live in a recycled home and don’t fly, we still cause more harm than we’d like. Our biggest impact is our car, we drive to attend events and gigs, and Kate also drives to work 3 days a week. Because of the amount of stuff we have to move we have a fairly large diesel car-van (a fiat Doblo) which whilst efficient for a car of its size still burns more fuel than we’d like. To be honest, in a perfect world we’d like to burn no fossil fuel at all. Further on this topic Corwen got into a bit of a discussion with someone on facebook who is planning to fly from Australia to the UK to attend a Druid event. We both think this is a startling example of cognitive dissonance, to travel in the most environmentally damaging way possible to a Druid event, but exactly how damaging is it? We did some maths. Imagine a camp for 70 people (hypothetically an ‘average’ Pagan camp). Lets say each of those people on average drives 70 miles round trip to get to camp. The camp’s CO2 emissions from transport will be around 800kg of CO2. If a single person flies across the Atlantic, even from this side of the States, then their flight more than doubles the CO2 impact of the whole gathering. What makes us feel worse is that we support these events and thus contribute to their impact, not only by driving ourselves, but by playing and running workshops we encourage others to come. Mostly that travel has a negligible impact but if people are increasingly flying to these events, the Pagan Camp scene’s environmental impact could double or triple easily without anyone noticing. Going back to this particular Druid camp, around 400 people go, and they travel further because it is a bigger event, lets say 100 miles each. The one chap flying equals the travel impact of more than 150 of his fellow campers. If three people fly from Australia then this more than equals the driving of the other 397 people. Those three flyers more than double the emissions of the whole camp. Events handle large amounts of cash, and most banks have no ethical policy. Whilst the ticket money is sloshing about waiting to be spent it may well be funding factory farming, GM crops, the arms industry, deforestation etc etc. Events should show that they try to handle their finances in an ethical way, using where possible financial institutions that have an ethical policy, such as the Cooperative Bank or Triodos. Even an event with 50 tickets at £30 has a turnover of £1,500, so it’s worth consideration, even for smaller gatherings. Event catering has a big impact. Could event organisers do more to endeavour to make sure that food sold is sourced as ethically (with as little environmental impact and as little animal cruelty) as possible? The easiest way to do this is to serve vegetarian food locally sourced. And what about minimising waste food, while we’re at it, and composting? Events could attempt to both quantify and mitigate the environmental damage they cause. This means both offsetting the CO2 produced (hopefully in some physical collective way rather than just paying an offsetting company- an industry which is dodgy to the extreme), and by making concrete attempts to reduce the CO2 emitted. Discouraging people travelling by air might be a start, if we set up an event we have to be responsible for the damage caused and try to minimise it. Providing networking opportunities for car sharing, publicising public transport options and making arrangements for collecting people from nearby public transport nodes would also be good. This event offsets its carbon footprint whilst seeking to reduce it, handles its financial assets responsibly and sources foodstuffs as ethically as possible. We’ll be making some attempt to publicise these ideas over the next few months, maybe through an article or two. I’d like to see all events that call themselves Pagan beginning to address these issues. Ultimately I’d like to only support events that signed up to such a pledge, and I hope other environmentally conscious Pagans would do the same. What do you think? Any other areas you’d like to see covered by a voluntary ethical policy for the camp scene? The Ancient Technology Centre is doing a fortnight long project with a school over the next couple of weeks which will be carried out in Iron Age costume. I guess most of the staff and me (I’m volunteering for a few days during the next fortnight) have pretty good Viking age kit, but none of us really have 1st century Iron Age, so Friday saw us making Iron Age shoes and Kate has been sewing peplums and tunics this weekend. 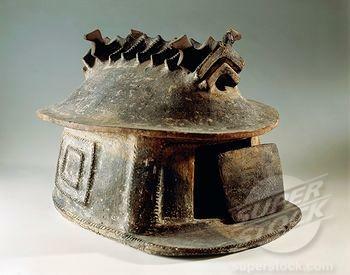 Iron Age shoes are made from a single piece of leather cleverly cut so that it can be laced around the foot. After making them I tried out mine and boy were they cold, especially on the cold ground, even with inauthentic socks on. This didn’t bode well for two weeks of roundhouse building… So I’ve been researching Iron Age foot insulation, and there is actually, contrary to common belief, a couple of finds of shoes containing woolen cloth or wool fibres, although most are stuffed with dry grass. So to be authentic we bought some meadow hay for pet bunnies from the supermarket and actually it really works, it is a little scratchy but it is certainly warm, far warmer than even two pairs of socks. I’ll let you know how it works out after a day of working in grassy shoes, and I’ll try to post some pictures of the full kit at some point. Between the three websites above there is enough information to have a go. Apparently the average family (whatever that is) needs 60 lbs of grain per year which can be grown on a 20 foot by 50 foot plot. Seems like a lot of space but then again its not impossible. I’d like to try oats too, but wheat is kind of iconic so we’ll try that first. Here’s an oaty page in case you are interested! There was something doing the rounds on Facebook this week that got me thinking. Well first it got me annoyed and then it got me thinking. Enough, in fact, to write the blog (or should that be rant) myself this week! It started with a copy of the London Underground map, only it’s titled a ‘Map of English Folk Music’ and the coloured lines are labelled Songwriting, First Folk Revival, Bands, Squeezeboxes, Fiddle, Guitar etc. It sounds like it could be quite funny and clever, but in fact, I didn’t think so, and nor did some of the people whose names appeared on it. So I got to thinking, what precisely was it about this image that bothered me so much? And after a while, I realised that it was precisely the same thing that bothered me last week when I heard Howard Goodall being interviewed on Radio 4 about his Story of Music programme on BBC TV. What riled me with Howard was his presentation of music as a linear progression from something primitive and simple in the past, to something grand and sophisticated. This seems to stem from the belief that classical music is somehow the culmination of hundreds of years of effort, and that other traditional and ethnic musics are somehow less important. I was also frustrated to hear him write off exploring music of other cultures as not relevant enough to include in a six part series, even though the UK has had links with the Indian sub-continent for centuries and trade along the silk road goes back millennia, bringing music, instruments and folklore with it. Surely the early arrival of the bow in Northern Europe deserved a mention! So back to the Map. Is the attempt to classify and pigeon-hole folk music and folk musicians to this degree is to be barking up the wrong tree? I can see what they were trying to do – make a simple guide to the main aspects of English Folk Music. But does that really achieve anything? I think I might be getting to the nub of my irritation here. For a start, there are so many folk instruments, it would necessitate the expansion of the underground throughout the UK to accommodate all the possible contenders And yet, not a whiff of a hammered dulcimer, whistle, crowd or harp, all of which have been played in England at least as long as the guitar and the fiddle. And what about ‘found’ objects – spoons, bones, tables, washboards, saws…? There are so many instruments that make up ‘folk music’ that it would be impossible to categorise every last one of them and still have a coherent map. Not to mention how you can represent amateur and professional folk musicians who excel at playing more than one and should therefore appear on several tube lines in the diagram. And then, the revivals, of which there have been 2 according to the map. Isn’t every rediscovery of traditional song a little revival? There are always articles popping up in the Guardian about the new fashion for folk music – this week I was pleased to see that it was the Child Ballads that made it into the Review section. There have been revivals on and off since people started collecting songs back in the Victorian era. Revivals do not necessarily require electricity and record studios. Even the fashion for collecting wasn’t new then – Shakespeare, Rabbie Burns, Ravenscroft etc were all collectors in their day. And what of the tireless amateur musicians? Would they not need a whole underground system of their own? It’s all very well listing all the people who have sold records, but they are but one tiny part of the English Folk Music scene. There are many people who week in, week out, sing the songs of their fathers and mothers, and make new ones of their own. And they are the ones who buy the records of the people that made it onto the map. There are few songwriters in the folk world who haven’t steeped themselves in traditional material or other people’s songs, or, like me, have started out as a song writer but then turned to other older wells for inspiration. Where do you put those people? So my point here? Are not both these representations of music – the TV show and the Map – attempting to distil something undistillable. It seems we are looking at 2 different definitions of Music here, one which requitres clear genres of music for sale that the staff in HMV would know where to put a new CD on the shelves, and one which is about people making music. What I’m saying, is that music doesn’t boil down to a few linear progressions. It’s a web of relationships, cross-fertilisation, experimentation. It can’t be frozen in time, because careers and hobbies take lifetimes, and people change, and so do audiences. People look to field recordings made in the early 20th Century, as well as modern technology. I might listen to some 60’s folk revival recordings to inspire my songwriting and versions of traditional material, but my version of English Folk music can also be informed by Arvo Part, Danish field recordings, Sigur Ros, and Delibes, not to mention our loop station. And you can’t really show that on a map. And so I was immensely relieved to see someone’s answer to the Map. It was a colourful scribble, with no stations at all, just all the colours messed up and random. Like Music. Apologies for missing last Sunday, we were deep in Tax Return Hell. We’ve climbed out of the Pit of Receipts though so normal service is now resumed! I was initially thinking about writing a post on the design of Pagan ritual, and how if we are creating a new ritual we need to think about what we are trying to achieve and use an appropriate ‘ritual technology’ to achieve that objective, but I think that can wait until next week. We celebrated a slightly late Burns Night celebration a couple of days ago and it got me thinking about the nature of calendar celebrations, and more specifically the Eightfold Year beloved of Pagans, so I think I’ll put down some thoughts about that from the same kind of headspace. Maybe I’ll call it a Structural Functionalist Critique (I feel fairly safe that no-one will bother to look that up on Wikipedia and see if I’m using the words correctly!). If you’re not a Pagan I guess these comments, in a broad way, apply to all calendar customs. So stay with me, eh? Anyhow our Facebook newsfeeds this week have been mostly full of people posting pictures of snowdrops and wishing one another Imbolc blessings or similar. The 8-fold wheel of the year rolls on and I wonder how relevant are the festivals of the Ancient Celts for modern people? Why do we carry on celebrating them, what is their function, personal and collective? For some people the celebration of the Eightfold Year is doubtless a matter of identity. Its one of those things Pagans do. Maybe if you don’t do it, you’re not a real Pagan? But what do we hope to accomplish from doing so? Well there is the Community aspect. Well we all celebrate these things so its a nice excuse to meet up and do something together. Nothing wrong with that. On the farm here we’ve recently, at Mo’s instigation, started an informal round of calender celebrations. We wassailed the apple trees, we had two (yes two, count ’em) Christmas Dinners. We celebrated Burns Night. All great fun and nice to get together and build community, not in a heavy way, just nice. I think the Eightfold Year works rather well from this point of view. Six weeks between festivals is about enough time to build up an appetite for the next one. The Eightfold Year is sometimes thought of as describing a mystery drama that unfolds through the year, telling the ‘life cycle’ of the Horned God and the Goddess (‘life cycle’ makes them sound like bugs, but I can’t think of another way to put it!). In this it is partly successful, although since several overlapping narratives are often used it does get rather confused. Some of this comes down to the Equinoxes, not really part of the original ancient scheme so no-one really knows what to do on them and they tend to get bits of neighbouring festivals attached to them. Maybe it functions better within a small group than it does across the Pagan scene as a whole. Six out of ten for this one Paganism! But for me celebrating the turning of the year is about getting closer to nature. It focusses the mind on the changes we see around us, ultimately its humbling because we realise that being human isn’t the only game in town, and that being in the nowdoesn’t make me so important as there is an awful lot of ‘before’, and there’ll be a big lot of ‘afterwards’, if you see what I mean. Now the Eightfold year may be a bit of a trap here. I’d like people to look out of their windows (hell, maybe even go outside) and celebrate what is actually happening in their world. Celebrating that the ewes are in milk may be folkloric, but maybe we should celebrate that the sun is a little stronger, that the birds are starting to build their nests, whatever is going on near you. This might mean maybe our celebrations won’t match up with other people’s elsewhere for timing. Maybe we’ll be celebrating some pretty odd things, but somehow it would be real. So don’t let those Ancient Celts tell you when to have your party, celebrate something that feels like it needs celebrating (the first Glow-worm of the year is cause for celebration here, as is the first time the outside tap freezes). I’m not advocating dropping the eightfold year, but lets add our personal calender to the sacred mix, because it is sacred too. Celebrating Robbie Burn’s birthday felt good, so I’m going to do that more as well this year. Ross Nichol‘s Birthday should be marked with a candle or somesuch and maybe Thoreau, Aldo Leopold and Arne Naess deserve some sort of remembrance involving a speech directed at dinner followed by an alcoholic pudding.